If you’ve been working in the SEO industry for any time at all, you’ll have most likely come across the practice of inbound link analysis: using tools such as Moz’s Open Site Explorer, Majestic and ahrefs on a client’s competitors’ websites in order to see where and how they’re getting links, which can therefore help to encourage and inspire your own client’s link building strategy. Obviously we can also use these tools on our own clients’ websites – doing so is absolutely vital if a client has been affected by an inbound link type penalty, for example. But it can also be useful in situations when they haven’t been penalised – i.e. so long as they have an already established website and/or domain, seeing where they have previously gotten links can be really handy to know. After all, are they already easily acquiring links in a particular way? Can it be pushed further? Better yet: can it be scaled? Welsh ICE is a co-working space just outside Cardiff. It’s also where I’m based as a freelancer. In addition to two co-working space areas, they provide office space (serviced offices), virtual offices, meeting room hire, event venue hire, telephone answering services, business support, business mentoring, assistance with business funding opportunities and have an on-site restaurant/coffee shop and day nursery. Whew. Why am I telling you all this? Because it shows how much they do and can offer their members. With many services available, they’re more of a ‘business centre’ (or even a startup hub) than a mere co-working space. And from a link building point of view, there’s a ton of different ways that they can acquire links. When I came on-board to help out with a little SEO, they had already been established for about two years, which meant that they had already acquired numerous links of their own accord. I thought that it’d be a good idea to have a look at where they’d gotten links and try to categorise them into groups. Using Open Site Explorer, Majestic and the Links to Your Site section in Google Search Console (formerly known as Google Webmaster Tools), I downloaded CSV reports of all the inbound links pointing to their website and combined them into one spreadsheet, removing the duplicates. A sample of some of the links we pulled back then. Back then I did this manually, but these days I would recommend using URL Profiler to make the job a lot easier and to add additional data. With the exception of ahrefs and any other similar inbound link analysis tools, it was a (mostly) full and comprehensive overview of their inbound link profile at the time. So what types of links were they getting already? The categorisation of the links was pretty tricky, as some things could’ve fallen into more than one category and some of the categories were pretty broad, but I did my best to categorise them as accurately as possible. That same list of sample links, but this time with their categories. 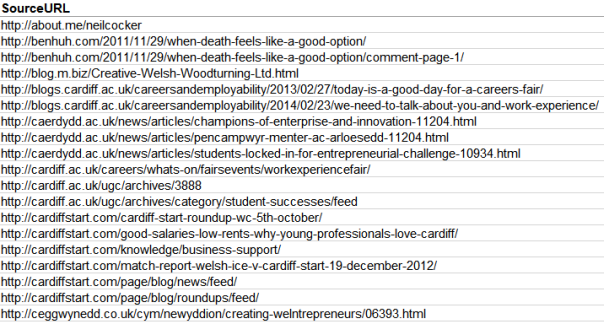 Once I had my categories, I tallied them in terms of linking root domains (LRDs), not links total. I did this because I didn’t want a site-wide link on one site (e.g. a blogroll or footer link) to ‘inflate’ the numbers in a category. The link categories tallied up. Admittedly, it’s not the most foolproof of analyses… After all, it doesn’t take into account Page/Domain Authority, just link ‘quantity’ – meaning that a ‘type’ of link might’ve only appeared once (which would’ve been considered bad), when in actuality it could’ve been a killer link with a high PA or DA score. However all I was after was a general overview of where and how they were getting their links up until that point. In addition to LRDs, I made a note to see if a particular category was responsible for university links (.ac.uk domains) or council/Government links (.gov.uk domains) – often considered to be hard-to-obtain and therefore valuable links as far as SEO is concerned. If a category type didn’t result in many LRDs but did get a few .ac.uk or .gov.uk links then it could still be a particularly big driver for the site at the time and therefore a potentially big driver as a link building tactic going forward. Members – When members of ICE linked to the ICE website from their own websites, blogs, etc. Beyond the Top 5 and in rough order from highest to lowest LRD numbers, other categories included: being listed in business/local directories, links from partner organisations, links from mentors, PR activities and guest blogging. An example of an ICE member naturally linking to the ICE website. The second-biggest way that ICE was getting links was via its own members. What can we do about that? Well, we can make it easy for them to link to us. We have toyed with the idea of designing an embeddable badge that could appear on members’ websites (e.g. something saying “I am a Welsh ICE member” with a link to the website). Given that partner organisations and mentors also like to link, we could design badges for them to use as well (e.g. “I am a Welsh ICE partner” or “I am a Welsh ICE mentor”). Observation #2 – More events = more links, so host more events! The third-biggest driver of links at that point was through their event venue hire activities. Why? Mainly because when someone hosted an event at Welsh ICE, they would share a link from their website/blog, their Eventbrite page, etc. to the ICE website, so that people could see its location. An example of ICE getting a link as a result of hosting an event. The simple truth here is: the more events that they host, the more links they could potentially obtain. This could even be scaled to an extent: hold three times as many events than they usually do and they could potentially get three times as many links from this tactic. This was a big and important insight. 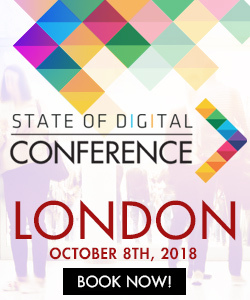 This isn’t simply saying “hey, try this tactic” – this is suggesting that if they push a certain side of their business, they could potentially boost their SEO, not only for the event hire side of things but for everything they do. As an SEO/digital marketing consultant, this is a powerful and important position to be in: we are not acquiring a link here or a link there, we’re suggesting how they could run their business in order to leverage and maximise their online marketing efforts. 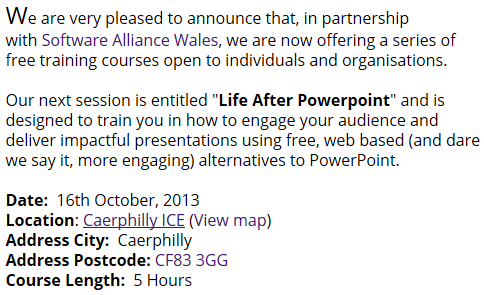 As mentioned above, Welsh ICE ran such an event, aimed at students. As it was appropriate for and of interest to their students, a couple of local universities linked to the ICE website’s landing page all about it, including Cardiff University and Swansea University. As link acquisition goes, this was a big deal. An example of a university (a .ac.uk domain) linking to ICE as a result of ICE’s student-focused event. They’ve since run a second Lock-In event very recently. The fact that running one helps the site’s SEO was a major contributory factor when deciding whether or not to run it again. I also suggested that they could (and should!) run other events aimed at students, as that could result in even more .ac.uk links. Even if they don’t come to you initially suggesting the symptoms of a link penalty (e.g. loss of rankings, loss of traffic, or both), it might be useful to see if they do have any dodgy- or unnatural-looking links at that stage anyway. Can you remove and/or disavow them? Can you dilute the profile with higher quality links? Even though I suggested capitalising on areas that are performing well (e.g. hosting events is a good one for Welsh ICE, as explained above), relying on a few tactics can be a bad move from an SEO point of view, say if Google were to give less weighting to a type of link in the future. With that in mind, especially if a client has a good number of links already, but only from a few different types of link ‘category’, is there the argument to try and focus your efforts on other different types of tactics and therefore futureproof their website’s link profile? Probably not really a big deal, but what’s the dofollow/nofollow ratio? Is there too much of one and not a lot of the other? 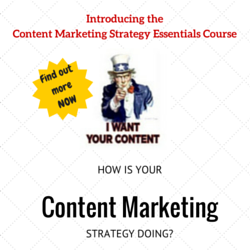 Going forward, can you tailor link building strategies that will bolster the one that is lacking? When I did this for Welsh ICE, it wasn’t something that I really took the time to do for other clients. But now, following the success of the analysis for ICE and the insights that it gave, it is often something that I prioritise when I take on a new SEO client. Taking the time to do something like this when the work first starts can really help to drive what happens later on.